This month, an exhibition of 150 sculptures by Pablo Picasso comes to the Museum of Modern Art, showing a less-known side of the well-known artist. 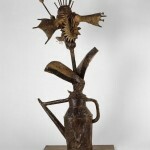 Pablo Picasso, Flowery Watering Can, Paris 1951–52, plaster with watering can, metal parts, nails, and wood. Pablo Picasso, Head of a Warrior, Boisgeloup, 1933, plaster, metal, and wood. 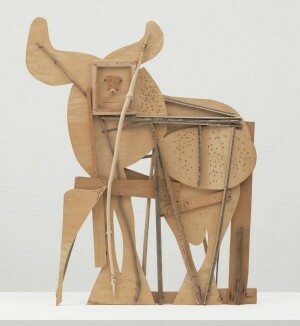 Picasso—who certainly felt the suggestions of the female form—used wood, paper, metal, cast-off supplies, and found objects to create his sculptures. Michelangelo’s solid, monolithic block of marble did not call to him, his sculptural practice being concerned with the accumulation of excess material, rather than the carving away of it. He used malleable materials that were to some extent “nearly formed” and combined them, creating the familiar shapes of his recurring fascinations (think: heads, the female body, the guitar, etc.). 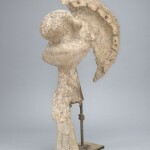 However, many of his assemblages after their construction were subsequently cast in bronze. As early as 1913, we see Picasso experimenting with found objects. Glass of Absinthe (Spring 1913), one of the works in the exhibition, unites painted bronze (the artist cast six bronzes from the wax original, each colored differently) with a real absinthe spoon. Of this choice Picasso said, “I was interested in the relation between the real spoon and the modeled glass. In the way they clashed with each other.” She-Goat, a 1950 sculpture that was cast in bronze in 1952, uses debris cast away by potters, which Picasso found in a yard next to his studio in the French town of Vallauris. The goat’s ribcage is a wicker basket, her udders are two ceramic jugs, the slope of her spine is made of flat palm fronds. He fitted other ceramic and metal scraps together with plaster, forming a structure that represents a goat while also suggesting the forms of the materials it was made from. 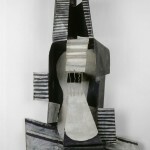 In 1912, Picasso created Guitar in cardboard, and then in sheet metal and wire two years later (he donated the piece to MoMA in 1971). The piece—which, with no solid center, is open to space—refuses the modeling techniques used to make sculpture for centuries. Made from common objects and depicting a common object, the piece shows Picasso—a trained artist, but not a trained sculptor—in an experimental and improvisational state. “It’s one of the true revolutions—to use an overused word—in sculpture, that one doesn’t need to be a trained sculptor but can instead use cutting, gluing, and piecing things together—as if working with Play-Doh,” says Umland. The exhibition history of Picasso’s sculptures pales in comparison to that of his paintings. 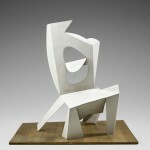 The first retrospective of his sculptural work, Hommage à Picasso, was mounted in Paris in 1966. MoMA’s presentation “The Sculpture of Picasso” which was held the following year, was the first and last survey of this body of work in North America until now. MoMA, which first acquired a Picasso sculpture in 1940, has the largest collection of the artist’s sculptural work outside of Paris, with more than 20 in its holdings. Loans from public and private collections, including a large selection from the Musée National Picasso-Paris, will combine to form an exhibition of some 150 sculptures. The show will colonize the museum’s fourth floor, spanning the entirety of the artist’s career. “This is the first [sculpture] show that separates Picasso’s periods; before, they were always mixed together,” says Tempkin. “Each gallery is a show within itself, and Picasso’s themes actually do correspond with decades,” she adds.